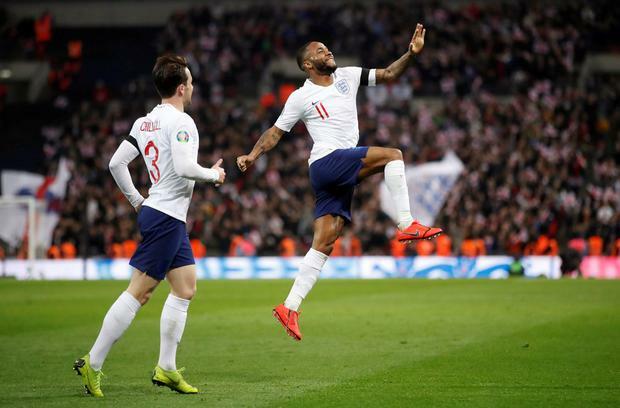 This has been Raheem Sterling's season in more ways than one, and there will surely be more significant nights to come for him, but his first hat-trick for England in the stadium he watched being built anew as a child will rank pretty high for the coming force of English football. This was also England as the way they see themselves now, picking off the next highest-ranked team in their Euro 2020 qualifying group with considerable ease in these high-expectation, post-Russia days. Sterling began the night with just four goals for his country in 47 previous caps, and until his two against Spain in Seville in October goalscoring was the key criticism of his international career. Against the Czechs he bagged a back-post slide-in, a shot on the turn and a handily-deflected effort from range, to be substituted later to an ovation and the man-of-the-match award. For club and country his record stands at 24 goals and his case to be among the individual awards at the end of the season grows ever stronger. There were debuts for Declan Rice and the 18-year-old Callum Hudson-Odoi, who might have had a goal himself in the later stages, the rebound inexplicably turned into his own goal by Tomas Kalas, Chelsea's perennial loanee, now at Bristol City. The other goal was scored from the spot by Harry Kane who had an exceptional game as creator and goalscorer, his thunder stolen only by Sterling who won the penalty too. It was the last touch of the first half with which Kane rattled his penalty past Jiri Pavlenka in the Czech goal, struck with the kind of certainty that meant even though the goalkeeper got a hand to the shot there was no chance he would save it. A two-goal lead felt about right against a Czech team that worked their hardest to deny England but had precious little when it came to challenging at the other end. For Southgate there was just the concern over Eric Dier who had started the game ostensibly in a defensive midfield partnership with Jordan Henderson but as the game progressed was the single holding midfielder. 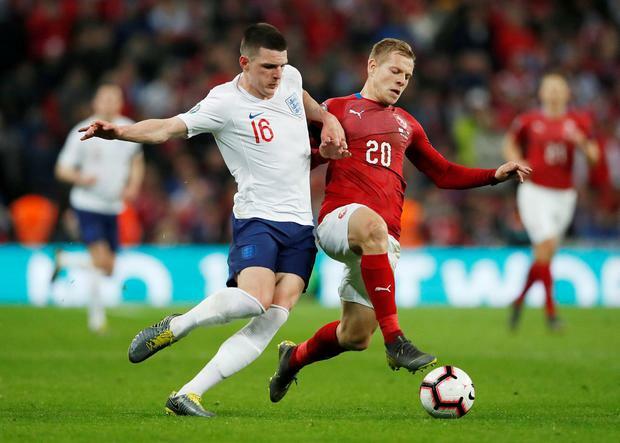 It looked like a toe problem from a heavy challenge from Tomas Soucek that meant Dier, after a few attempts to get himself going, had to come off after 17 minutes to be replaced by Ross Barkley. New boy Rice had warmed up but Southgate was reluctant, it seemed, to tie himself in with another defensive midfielder. From the early stages, Henderson had been playing in a more advanced role as part of a midfield three with Dier and Dele and so when Barkley came on the Liverpool man dropped back into the role vacated by the departed Dier. It was a 4-3-3 for England, and when they attacked they looked extremely hard to stop. On the right wing was Jadon Sancho making his second start for England. On the opposite side came Sterling, whose goal after 24 minutes was his 22nd for club and for country this season. Once again he showed that he knows the value of attacking that backpost, the right man in the right place at the right time. Sterling won the penalty too, breaking this time into the left channel of the box and drawing at least three opponents onto him, and Kane made no mistake. The Czech effort ebbed after a start to the second half when they fashioned a few chances and Jordan Pickford was at last obliged to make a save but the visitors were woefully open all over the place. Sterling's second after the hour came from a driving run from Kyle Walker down the right channel and more tragi-comic defending from the Czechs. There was another unfortunate ricochet and suddenly Sterling had the ball at his feet, spinning away from the defender Ondrej Celustka for the 23rd goal of this epic season of his with his left foot. His hat-trick came on 68 minutes when Barkley was permitted to cover around 50 yards galloping forward before threading the ball left. Sterling's right-foot shot clipped Celustka and beat Pavlenka.